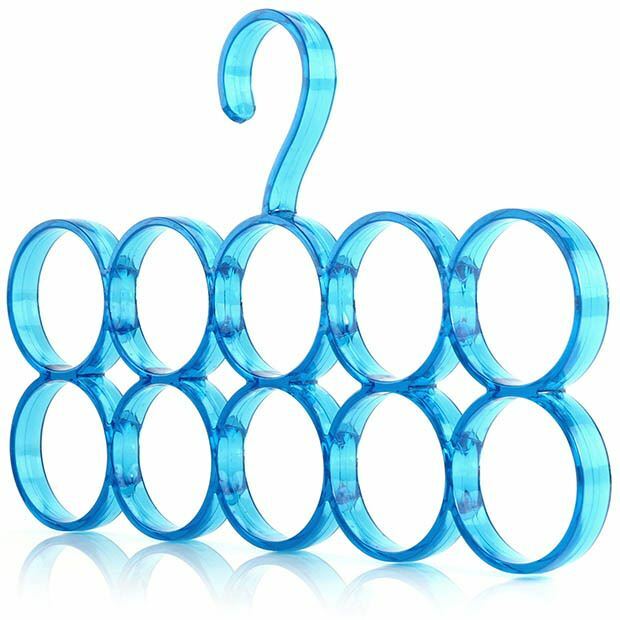 Premium quality blue plastic accessory hanger with 10 openings. Now it's simple to keep all your scarves, ties, belts and jewellery tidy, organised and easily accessible. Hangs up easily in a wardrobe. Can be used in a cloakroom, hung on a door or wall hook or simply placed in a drawer. Each opening is large enough for a single scarf or a couple of ties. Makes an unusual, practical gift for him or her! Comes in solid attractive retail box. Size: Width x Height 32cm x 20cm (12.5" x 8") approx. Diameter of each opening 5.5cm ( 2.2") approx. A nice sturdy hanger and does not take up any more room in my wardrobe than a normal hanger. It is great to be able to see my scarves so easily. I folded each of my scarves in half and looped the free end through the end (as you would when wearing a scarf) this prevents the scarves from slipping off the hanger.I am very pleased with this hanger.